Talk about a return to form. 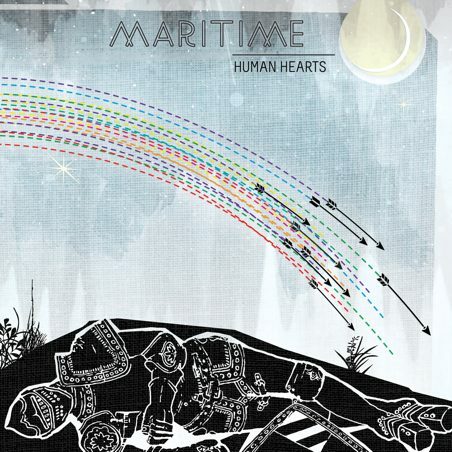 Maritime was one of my favorite bands the moment I heard 2006's We, The Vehicles. Their combination of sincerity and power-pop hooks just tapped into my mid-twenties sad-guy zeitgeist in a way that the whinier of bands (I'm looking at you Bright Eyes and Death Cab for Cutie) never did. So back in 2007, when Heresy and the Hotel Choir came out, I felt a tinge of disappointment. Not because the album wasn't as good as the previous (it wasn't) but because lyrically Maritime seemed to be reaching to create something that was not ready. The album felt like a half baked pie. Sure, it tasted and resembled pie in all sorts of ways, but it just wasn't as delicious as the finished product that I knew. Even with it's high points, Heresy left me a little cold. So, Maritime took a little break. A four year-long break. And in that time, they have crafted a more spectacular album that jumps back to the glory of We, The Vehicles, harnessing the same jangly hooks, strong guitar riffs and sprawling musical scope on Human Hearts. And lyrically, they have returned to form too. We've gone back to disillusion and distemper set to pop beats. And frankly, it's very nearly perfect. Martime isn't necessarily for everyone. I'll acknowledge that right now. Some people find Davey von Bohlen's voice (von Bohlen's voice is a little more produced here, something that may be slightly distracting, but really doesn't detract from the album as a whole) to be a little too airy and precious, but beautifully, Human Hearts operates on a guitar and drum heavy mixture that keeps the music feeling strong and gutsy, even as the lyrics contemplate emotional disasters and lovelorn complexities. This is especially evident on the sixth track "Faint of Hearts" that opens with a long, grungy, thick guitar and drum build and falls back into a marching drum scheme that perfectly backs von Bohlen's voice. It is a beating heart. And then an explosion of guitars. It feels like desire and passion, but never drifts too far toward the saccharine. The opener, "It's Casual," a song featured as the lead-in to the A.V. Club's Undercover 2011, is the perfect way to start the album, heavy with hooks and compassionate. There remain a lot of the late-'90s-early-'00s guitar sound throughout the album, with sweeping guitar gestures and quick, simple, distorted solos, especially on the raucous "Annihilation Eyes." And the more experimental "Out Numbering," which operates on muted guitar riffs and some vocal-mixing/manipulation rises and falls in brief peaks and valleys that are exceptional. "Paraphernalia" and "Black Bones" both rock. And really, there just isn't a bad track on the album. Clearly, in taking a long break, Maritime has carefully crafted these ten tracks in a way that seemed to be missing from Heresy. It's back to basics with Human Hearts, going straight toward the album's titular hearts. Maritime has brought the humanity back and are once more unapologetically sincere, and that is the band's truest mode as the confronters of modern emotion and loving dissatisfaction. Listeners will feel good through each track and will find invigoration in the sturdy, energizing drugs. You can listen to the whole album, which comes out on April 5th, via the A.V. Club's streaming player here. And then, when you fall in love with it, you can take a little journey with your dollar bills and pick up a copy to cherish.